Update (14th March, 2017): To celebrate the five year anniversary of Journey's release, we're bringing our original review back from the archives for one day only. A seminal moment in PlayStation history. Enjoy! Originally published (1st March, 2017): Journey is a seminal release; the kind of title that comes once in a generation. It's PlayStation 3's ICO: an interactive adventure that collapses the common expectations for the medium. It's not always perfect, but its imperfections make it beautiful. 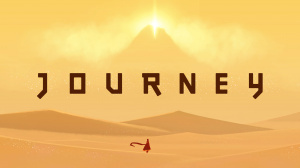 Journey is a game about everything and yet nothing at all; an adventure wrapped in poignancy, optimism, hope and trepidation. It is what you make of it and nothing more. It's also the most mechanical of thatgamecompany's releases. Gone are the ubiquitous breezes of flower and the darting emblems of flOw, and in their place is a hooded figure wrapped in a gold and crimson embroidered shawl. The protagonist represents you. Movement is familiar. The left analogue stick controls where you want to move, while the right analogue stick – or alternatively the Sixaxis motion sensor – manipulates the camera behind you. You have two additional abilities: to sing or to fly. The former can be executed upon will, and is used to interact with the world as well as the strangers you encounter throughout your journey. Flight is tied to a meter represented by a tapestry upon your scarf and you'll need to interact with magic carpets dancing gracefully in the wind in order to recharge the ability. The length of your scarf depicts the time you have available to fly, with silver emblems hidden throughout the world extending your animated accessory. 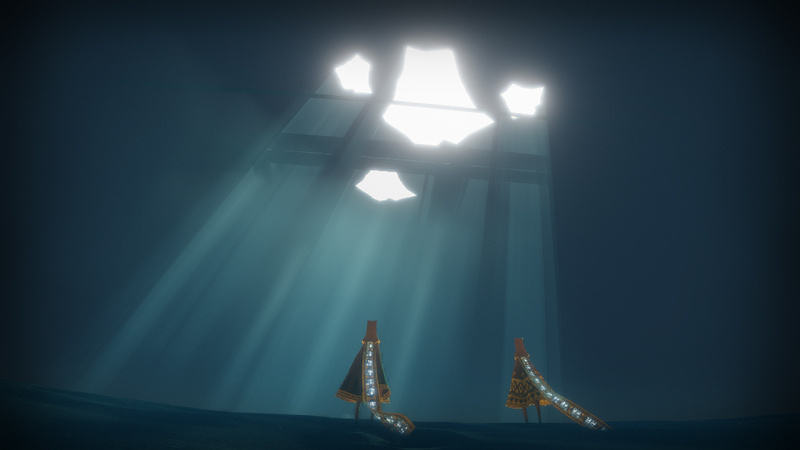 thatgamecompany trades on minimalism, and Journey is no different: a fleeting start screen, the most basic of visual cues and the level design itself is all the game offers to guide you. And yet, for all its minimalism, you'll never be unsure where to travel. The glimmer on the horizon is enough to make your objective clear, without dissuading exploration. Sand dunes bleed into ruins that lead into foreboding ocean beds. Like any true adventure, Journey is packed with visual variety that drives the sense of progression throughout the experience: the bright surroundings of your curious starting point are warm and homely, and contrast with the dark storms and eerie temples discovered as your adventure protracts. As bad weather sets in, the sense of weariness conveyed throughout the controller is unparalleled. The orchestral backdrop fades away to highlight the monotonous thud of your footsteps, accentuated by the slow, dwindling bursts of rumble passed through the DualShock 3 controller. The emotional payoff at the campaign's conclusion is by far one of the most evocative moments in games. And emotion is something that's present throughout Journey. It's the kind of game able to make the hairs on the back of your neck stand on end – not once, not twice, but multiple times throughout its relatively short running time. But more than that, it's a game that makes you feel. The sense of place is staggering, from the build-up of winds that dash around you in the campaign's early environments to the sense of dread later on as a mysterious mechanical manta ray hunts for any sign of movement on the deserted sands below. It's a game that asks many philosophical questions, but is never upfront about any of them. Whether you want to simply enjoy the sense of place or question the meaning behind the many graveyards surrounding you, Journey is bold enough to sit back and simply direct the adventure at your own pace. Key to the sense of immersion is Austin Wintory's outstanding orchestral score. The audio meanders throughout many tones during Journey's course, from exotic up tempo xylophone-led jams through to intimidating string-driven discords. 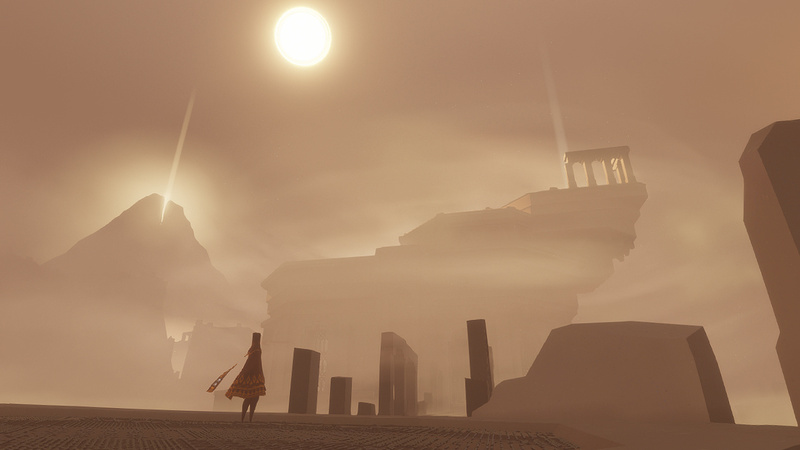 The pace of the soundtrack is perfect, with thatgamecompany using Wintory's score to pick out crescendos in the gameplay. 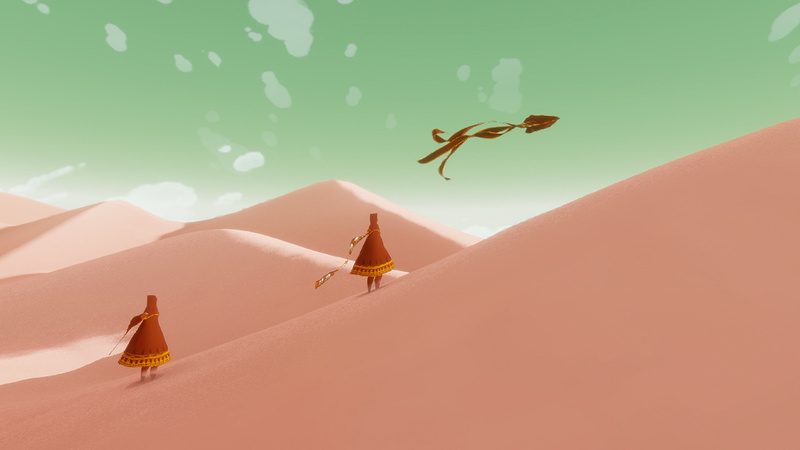 Sliding down a sand dune to harmonious melodies is one of the most empowering moments in games (if not media) and it creates a longstanding impression by which you'll remember the game. It also doesn't hurt that Journey is one of the most technically impressive games available on PlayStation 3. It might be a downloadable release, but Journey is on a par with the likes of God of War and Uncharted as an example of what Sony's hardware can do. The sense of scale throughout is sublime, but it's the littlest details that set Journey apart: sand parts naturally as you walk through it, creating a natural breadcrumb trail of your journey so far. Set the controller down and your protagonist will sit and sink into the sand, only to shake the residing granules off his clothing once you awaken him. The sand kicks up in swirls and ripples as the wind blows, creating makeshift waves by which you can surf from one side of the horizon to the other. 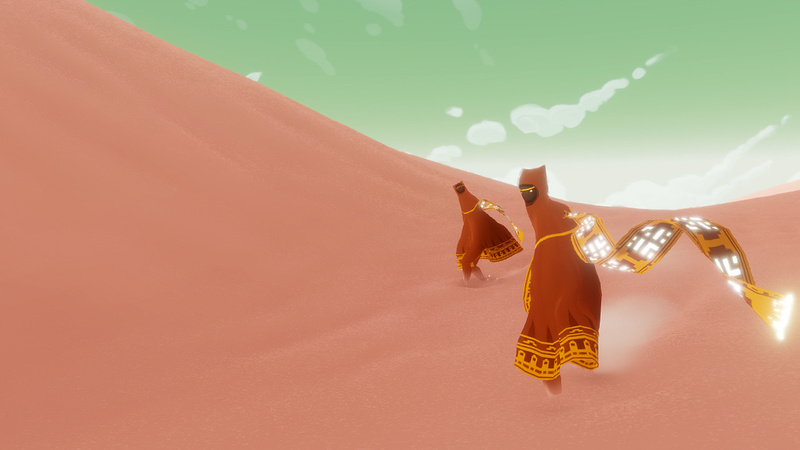 thatgamecompany also makes considered use of colour to orchestrate your journey. Golden skies transition into murky greens in order to convey the passing of time; red is a predominant colour throughout, used to conduct your path in the world. And yet for all the activity within the environment, your adventure feels isolated unless you happen upon the company of another player. The game never opens up communication with your companion – you'll never learn of your counterpart's PSN username, nor be able to discuss strategies with them over voice chat – but you'll feel a connection to them nonetheless. The game's sing mechanic becomes the best means of communication, as you work within the game's confines to form bonds and continue your journey together. There's no insistence for you to communicate with the other players you encounter; you might simply decide to wander past them like the crowds in a big city. That's your prerogative — there's no advantage to working with another player other than the draw of sharing your experience with a stranger. Your choices will depend entirely upon your personality. This is honestly one of the best games I've ever played. Do not miss out on it. Wonderful review, Sammy. The beta was absolutely enthralling; can't WAIT to get my hands on the full version in a couple weeks! If I completely hated Flower, is there any chance that I might like this game? The screen shots provided are among some of the least interesting ones I have seen for any game on any platform (way back to the Atari 2600) and certainly don't represent the "visual variety" that you discuss. @autogolazzo For the sake of preventing spoilers, only the first area's aesthetic has been made public through screenshots or from the beta thus far. There was a small taste at the very end of the beta of how it will be changed up throughout the game, and I can tell you, there indeed appears to be quite a lot of variety. @autogolazzo If they showed the visual variety it would spoil the game. Trust me, it's there in abundance. I think you could hate Flower and enjoy this. Journey is a lot more mechanical. As for the screenshots, maybe you need to see it in motion? Journey is one of the best looking games ever made in my opinion. It really is incredible. Holy eff, I didn't expect a 10. I might have to get this. I bought flOw and soon tired of it. I never bothered with Flower. And I wasn't at all interested in Journey... until I played the beta last year. I fell in love with it, and have been waiting eagerly for release ever since. I really want to find out more about that foreboding building which appeared at the end of the beta. Roll on the 14th! This was a really good review! I know I'm sold. Even from the short time I spent with it last year I felt like a 10/10 was a possibility come full release. Great job, Sammy, and I can't wait to play this. I KNEW this was going to get a 10! I enjoyed flow but loved Flower. 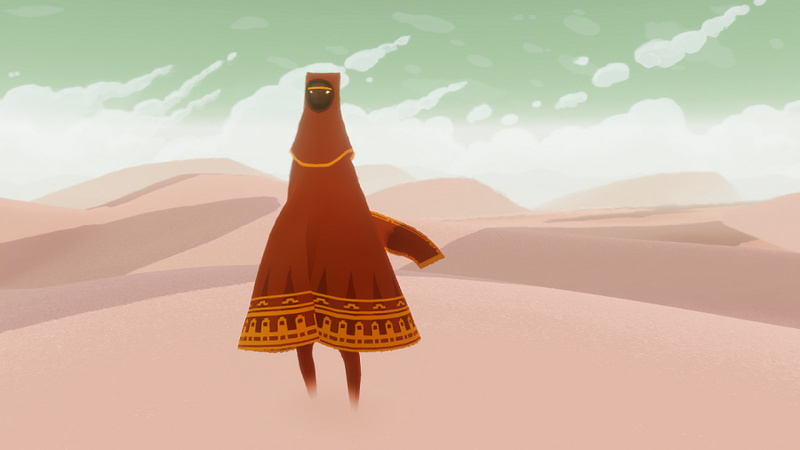 If this review is any indication, Journey out does the previous games thatgamecompany has made. I can't wait. kinda shocked it scored a perfect review! Awesome review Sammy-boy! Can't wait to finally partake on my Journey. 10/10 on a digital release is very rare these days, but I'd love to try it out sometime. "Take a Journey to a paranormal world wherever, whenever! On the bus stop! At Grandma's! In space pooping rainbows!" I cannot wait to download this! I knew this game was going to be something very special when I first learned of it; and it looks like I was right! 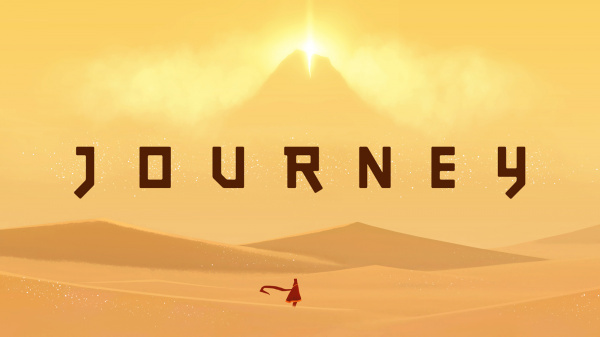 Games like Journey show what the videogame medium is truly capable of; if only more developers would have the courage of abandoning the 'videogame style' train of thought when making their software, we would have more games like Journey, Heavy Rain, Flower, etc. Of course, it would be a bit presumptuous of me to label this an 'instant classic' without even playing it...but what the hell, it's an instant classic! @Kage_88 I'm so excited to see what David Cage does next. Hopefully we'll get a glimpse at GDC next week. best review (of the best game?) on new Push Square to date . nice one ! Even not being able to play this game (no PS3 here) I reckon this is a well earned 10/10 if there ever was one. Looking forward to getting Journey next week. Pity it doesn't play with Vita cause i haven't put that machine down since last Tuesday. Looks great. Im buying. Its real short from what i hear, is it worth the 14.99? That would be my only concern at this point but its still a insta-buy. I've only dropped a few hours into my first Journey, but I've never had a game captivate me the way that Journey does. I'm a PSN+ member and only heard of this game when I saw it in the PSN store. Decided to download and played it for about 15mins. At first I didnt know what what to do and what the objective of the game was, then I saw another player and followed him/her. I tried my hardest to communicate with them but to no available, but as i follow him i've learn the objective of the game. I really got into it. The next thing i know, it was about an hour into the game i didnt want to put it down. I didnt want to lose the guy that I was following. It have an impact on how you interact and give you a sense that you're the only one in this world and he is your last friend. It is NOT true that you never learn your companions' PSN ID's. They're all listed for you at the end of the credits. Of course, you don't know for sure which was which, and the lack of actual communication with them during the game makes the information of little use, but it's an interesting inclusion nonetheless. Honestly, though, I didn't enjoy this game HALF as much as most of you seem to. It was confusing for the entire duration of the experience, never being sure where to go or what (nevermind HOW) to do. Some of the people I came across lead, others followed, and one just sat there (convieniently earning me the Reflection Trophy, at least). I'd say I bonded most (inasmuch as it could be done in this game) with the one I spent most of the latter half of the game with...but it still hardly matters now, does it? Having played through now, I can say that this exceeded all my expectations. Magnificent, awe-inspiring game; gorgeous, great sound design, one of the best co-op experiences I've ever had. Yikes, you've spent a whole 5 years proclaiming this is the best game ever made for PS3 and PS4? That's quite the Journey. Walking up the sheet white mountain with zero energy and trudging on. Just so you can beat the other guy the to the top at 1mph. First time I played it was a few months ago on the PS4. I will say it is definitely one of my favorite games of all time. Such a masterpiece. Still one of my favourite games of all time. Nothing has impressed me the way Journey did ever since I played it. Some brilliant games yet nothing truly unique. I played this a few months ago for the first time, and was (unfortunately) quite bored and unmoved. Great that so many people have been moved by it though - there's room here for everybody! one of my top 5 games of all time. I recommend this to everybody I can, it's hard to describe but truly a classic in every sense of the word. can't believe it's been 5 years, I remember getting it a week early because i preordered it on PS3. got a 6pack and played it through in amazement and awe. A true 10/10. This is easily one of my favourite games of all time. Thought it was excellent - didn't resonate as much as I wanted it to but to be honest, I am not sure I 'got' it first time through. That said, I will give it another go at some point. Also one of the hardest games to explain ever. This "game" will always live in my memory as something unique and more than the some of it's parts. Are games art? This game, more than any other, makes a good case to be an amalgamation of both. For me, there is no game like Journey. So abstract but so very specific. I return to Journey every now and then. I am unable to recreate that experience of the first time I played it but I still come back to it. I also played it with my kids and watch them play it. It brought many good discussions about life. The kids felt what the game was all about without me explaining things. Finally, like life, Journey is both full of joy and sorrow that are intertwined. Man, I really didn't get this game. Maybe I should replay it one day to see what I missed. On a purely visual level Journey is astounding. It's definitely one of the games you would use to put forward the view that games are/can be 'art'. 'Tis a thing of beauty and a joy forever! Still the most over hyped piece of garbage game on the market!